Earth continues to increase its temperature. According to NASA scientists, the 10 warmest years in the 134-year record have all occurred since 1998, with 2010 and 2005 ranking as the warmest years. The average global temperature in 2013 was 14.6 °C (58.3 °F), which is 0.6 °C (1.1 °F) warmer than the mid-20th century. The following video shows a color-coded map which represents how Earth’s surface temperature has changed from 1880 to 2013: red colour denotes higher-than-normal temperatures and blue colour denotes lower-than-normal temperatures. The temperature analysis done by GISS is compiled from weather data from more than 1 000 meteorological stations around the world, satellite observations of sea-surface temperature and Antarctic research station measurements, taking into account station history and urban heat-island effects. Software is used to calculate the difference between surface temperature in a given month and the average temperature for the same place from 1951 to 1980. Ununtrium is a man-made element so unstable and radioactive that only tiny amounts of it could be observed and created. Like Plutonium, Ununtrium emits deadly alpha rays as it decays, a radiation much more harmful than gamma and beta rays. Little is yet known about its properties and applications, but it is likely that Ununtrium could only be used in the nuclear power or weapons industries. In both cases, it is inevitable to remember the Fukushima Plutonium nuclear power plant that failed after a 9-scale earthquake in 2011 (even today a 12-mile containment zone exists) and the Nagasaki implosion-type fission Plutonium bomb that exploded at the WWII in 1945 (200,000 deaths). Even though Japan has these experiences, Ununtrium is officially recognized by Japanese researchers in the Riken Nishina Centre for Accelerator-Based Science. This begs the question why these elements are being made, especially when Ununtrium is more destructive than Plutonium. One explanation could be the thirst for search and desire to find the “Islands of Stability”, i.e. ; the elements that belonging to this kind of heavy elements are extraordinarily and unexpectedly stable, unlike the rest which are very unstable. 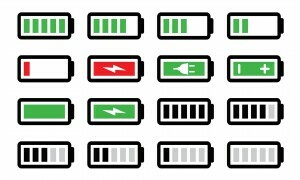 What is your opinion about this kind of research? In a world that the rate of technological and social change accelerates frighteningly, change itself often seems to be the only constant. The time has come and gone where the papers acquisitions can be based solely on printed copies, due to the online-publication. First the pdf-files appear, followed by the posterior audioslides. Now a new approach has arrived based on videos: you submit the manuscript, and the journal produce the video. 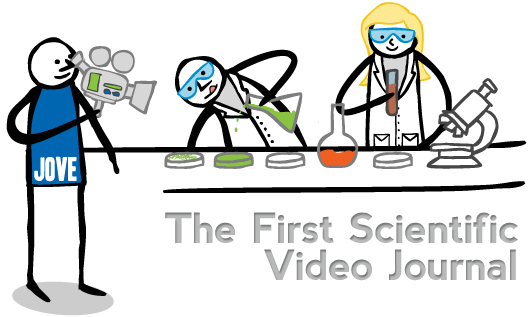 Examples of JoVE video articles from labs at MIT, Harvard , Yale, Stanford, Princeton and Caltech can show leading scientists communicate their research in the most innovative format. As a result, universities are acquiring usage rights to JoVE (video)articles, e.g. the Univiersity of Arkansas Libraries. Technology has been a force in the development of civilization, all the more so as its link with science has been forged. In the broadest sense, video-papers could extend our abilities to change the world: to cut, shape, or put together ideas; to move things from one place to another; to reach farther with our hands, voices, and senses. Are you ready to be the actor/actress of your dreams? 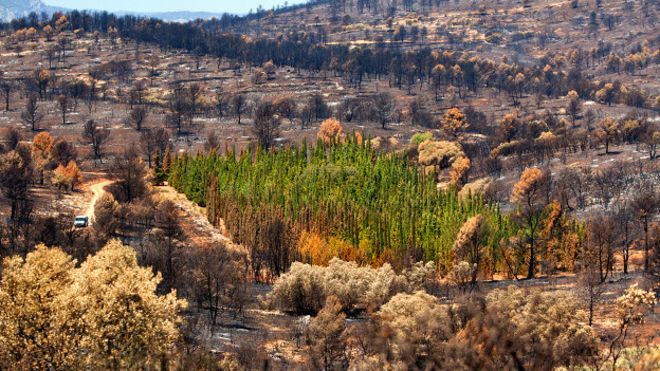 The cypress trees shown in image resisted a fire that had devastated 20,000 hectares around Andilla (Spain) in July 2012. All around the 9,000-m2 area of cypresses, including pine, oak, holm oak, juniper and gorse trees; had been consumed by the flames, whereas, only 12 cyppresses burnt (1.26% out of more than 940 of mediterranean cyppresses in total). The high resistance of the cypresses to ignition has raised the possibility of using this species in fighting forest fires. Especially noteworthy is the behaviour of the tops of the trees which, despite the fact that the trees are packed close together, the fire did not advance through the higher branches and on the top of that, the flames barely caused the drying out. “La naturaleza tiene la respuesta a muchos de los problemas que enfrentamos” B. Moya. * Della Rocca, G; Hernando, C; Madrigal, J; Danti, R; Moya, J; Guijarro, M; Pecchioli, A; Moya, B. 2015. Possible land management uses of common cypress to reduce wildfire initiation risk: a laboratory study. The TV show Mythbusters interleaved two phone books and dramatized how hard it was to pull them apart. They ended up needing two tanks to pull the phone books apart against the resistance of friction. Students from a wide range of disciplines are able to apply, and depending on qualifications, are selected for internships that relate either to the organization’s strategic activities or to administrative or technical functions. Internships afford you the opportunity to work in a multi-cultural international organization. The applicant MUST be in his/her third or fourth year of under-graduate (BA/BSc.) or in a graduate (Masters) or post-graduate (PhD) programme, and must continue to be enrolled during the period of the internship and after. Willingness to intern on a full-time basis spending five days a week for a period of not less than THREE MONTHS and not exceeding SIX MONTHS.